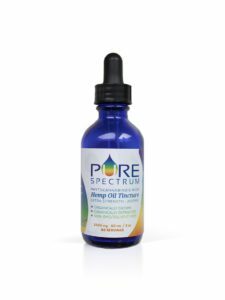 Pure Spectrum hemp oil tincture contains organic full-spectrum, whole-plant hemp CBD oil and boosted with an organic nutraceutical-grade CBD isolate. They blend their phytocannabinoid-rich hemp oil with organic fractionated coconut oil to give it a smoother taste and better absorption. Each batch is tested for potency & purity, and they provide test results with every purchase. Available is 250mg, 500mg, XL 1250mg and XL 2500mg bottles.